The Charles Lloyd New Quartet with Jason Moran, Reuben Rogers, & Eric Harland playing at Town Hall. All Photographs on this website Daniel Sheehan © 2009. All Rights Reserved. Please inquire for permission before using. 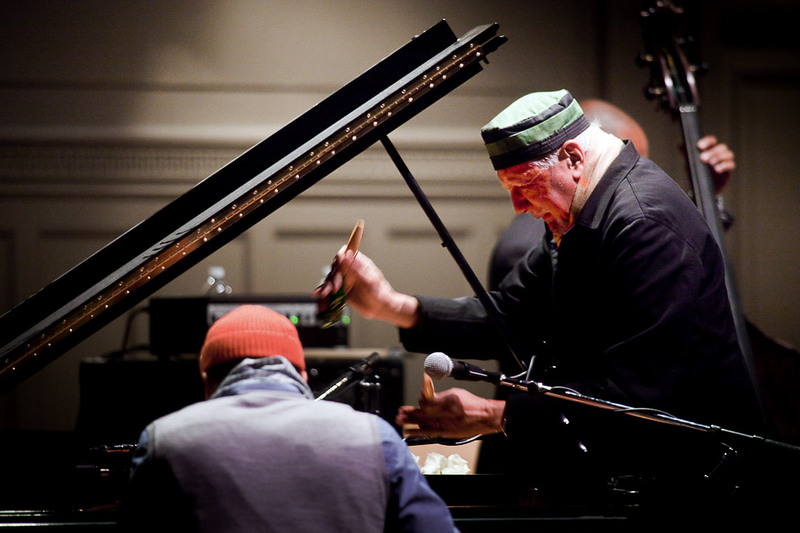 It was a beautiful new group Charles Lloyd brought to town earlier this month. I have been meaning to post some more photos form this performance before the holidays. Here they are. If you missed the show it was a wonderful performance. Charles is one of my all time favorite musicians. 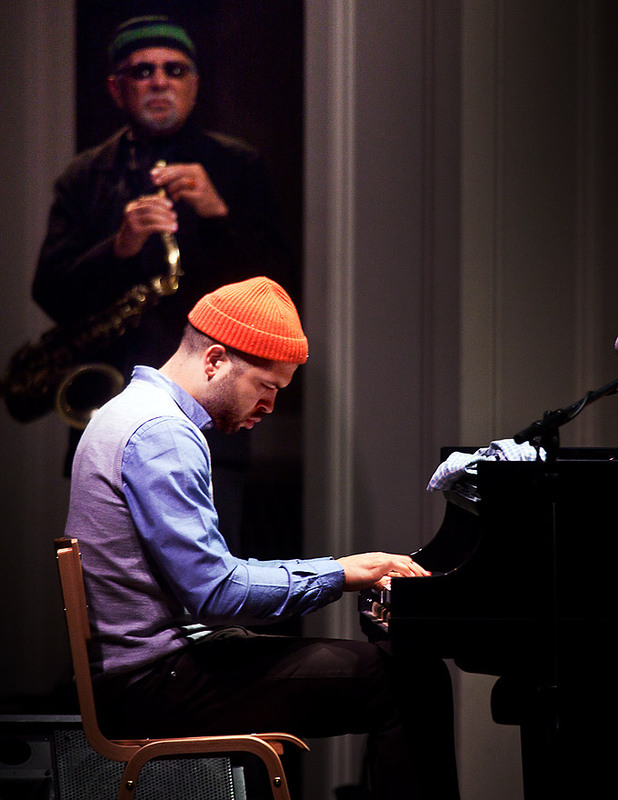 And so is Jason Moran. I was happy to get the chance to hear Eric Harland and Reuben Rogers play as well. These cats were very intense and yet the music was very spiritual. 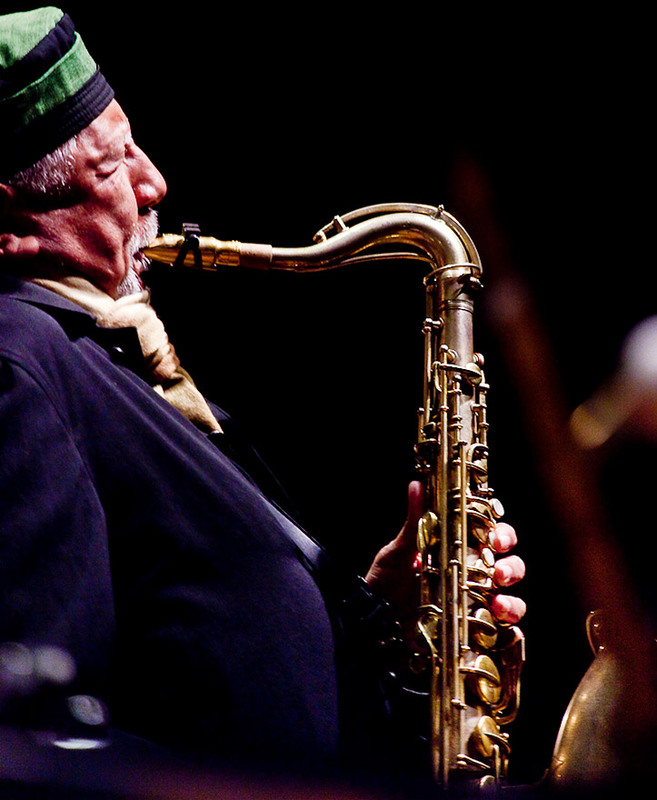 “Since the 1960s, tenor saxophonist and flautist Charles Lloyd’s life has alternated between periods of musical and personal exploration. After spending a decade or so working as a sideman in different blues and jazz groups, Lloyd hit a goldmine of critical acclaim and popular support in with his quartet’s groundbreaking performance at the 1966 Monterey Jazz Festival (no small feat in a period when jazz’s audiences were largely moving in new directions). This particular group was notable not just for Lloyd’s debut as a fresh and exciting leader, but also because two of its members, Keith Jarrett and Jack DeJohnette, were themselves only a few years away from exploding as widely innovative and influential jazz musicians…. Lloyd’s New Quartet is fortified with relatively young but well-established jazz musicians who are fully capable of sharing Lloyd’s pursuits. 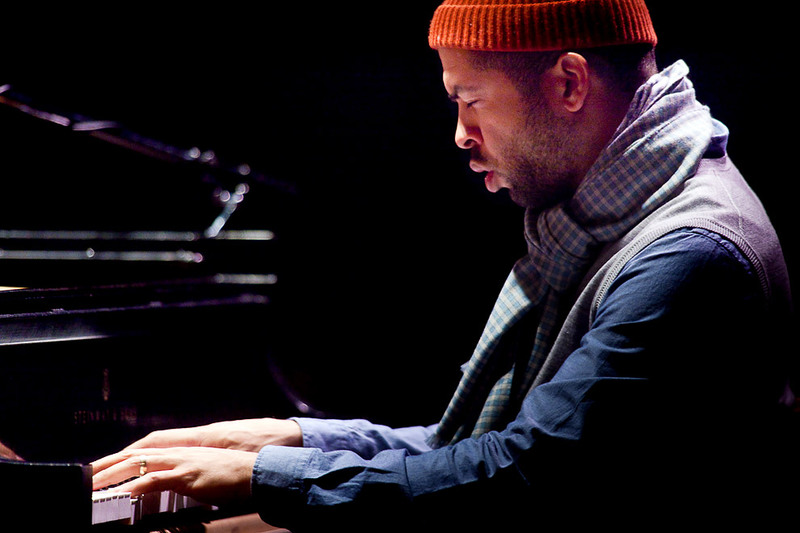 A leader in his own right, Jason Moran (piano) brings the group a unique, mature second lead voice. He’s one of those pianists who sometimes convince you that you’re listening to 80 years of jazz piano history rolled into one set of fingers. His heavy left hand will dabble in vintage 1920s stride playing right before flowing through a sequence that breaks into advanced Andrew Hill territory, while his frank, direct solos often develop in unpredictable turns that take full advantage his repertoire’s diverse influences. On stage, when Lloyd himself isn’t soloing, he doesn’t just stand there; he frequently can’t resist dancing to the pulsing, breathing rhythms provided by his fellow musicians. 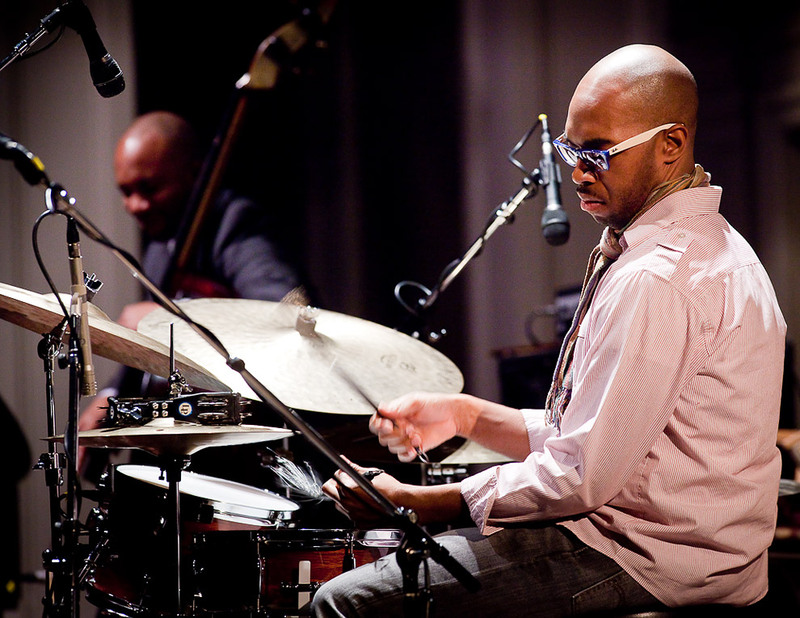 Reuben Rogers (bass) and Eric Harland (drums/percussion) form a reliable, gregarious backbone that’s perfect for bringing the exotic structures in Lloyd’s compositions to life. 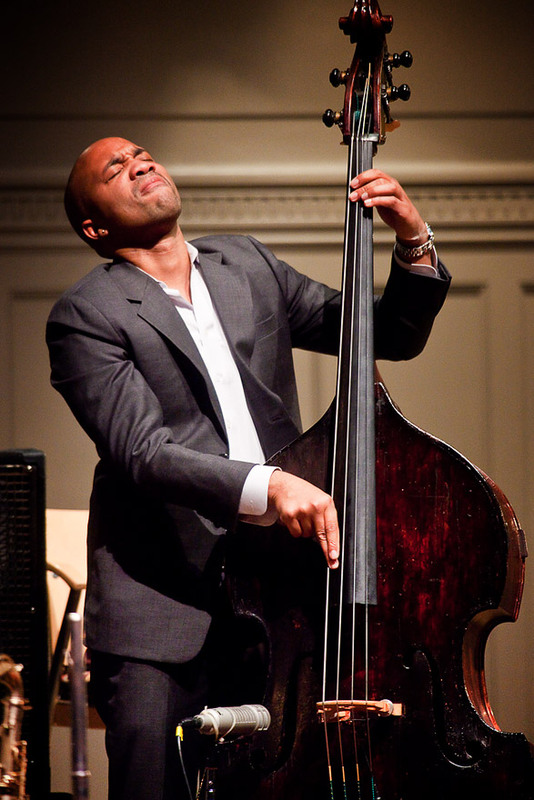 Whether the tune is funky, swinging, Latin, or has no definable rhythm at all, the team decorates it with outbursts that always feel natural and appropriate….” – Nathan Bluford from the Earshot Jazz program guide. Jazz Photography by editorial photographer and photojournalist Daniel Sheehan who covers jazz performances, and creates portrait photography for publications and corporations.